Plenty of wildlife, such as dolphins, on the wild ride around the wild coast of Tasmania's Bruny Island. 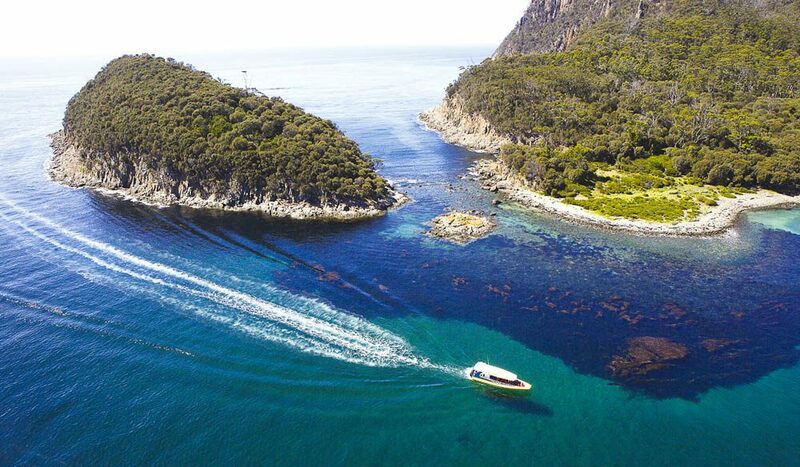 What better way to admire the famously craggy cliffs of Bruny Island – and the lively wildlife they play host to – than from the water? A three-hour eco wilderness cruise will have you zipping around the base of these soaring, jagged cliffs, which rise proudly out of the sea to remind you just how small you really are in mother nature’s scheme of things. Once you get over the sheer scale of the coastline, you’ll be blown away by the dolphins, whales, albatross, eagles, gannet, shearwater and petrel, all just doing their thing in this wild Tasmanian playground. The distinctive yellow inflatable boats are small enough (43 people max) to navigate through cool rock formations such The Monument. The locals are friendly, too – dolphins often surf the bow of the boat, and it’s not unheard of for a whale to pass directly underneath. Pennicott Wilderness Journeys runs the three-hour Bruny Island eco wilderness cruise daily (one tour per day in winter and two per day in summer), departing from Adventure Bay on Bruny Island. Adult tickets are $125, children are $75 and family tickets (two adults and up to three children) are $390. Full day also available. For bookings and information, call 03 6293 1465.